Luscious, rich and lemony hollandaise gets completely re-imagined here as a light, supremely creamy puree of avocado, lemon juice and olive oil. If you thought you loved eggs Benedict before, prepare yourself to be completely overwhelmed and obsessed. This hollandaise will replace the traditional for all your eggs bennys from here on out. Switching up how you make hollandaise sauce is a fun way to riff on this brunch staple. Here are five different ways to approach this classic sauce. For a heartier sauce (that’s especially good with steak and eggs), reduce dry red wine and port instead of white wine. Even easier (and potentially tastier) than fussy hollandaise? A classic Mornay sauce made with Gruyère. When making the classic French sauce, Jacques Pépin goes through the trouble of cooking the butter until it smells like hazelnuts, so you should, too. Make hollandaise even more decadent by adding pricy (and delicious) foraged mushrooms. 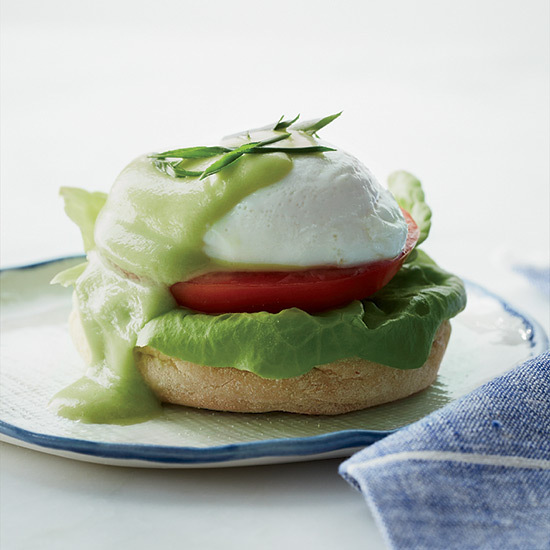 Blending avocado with lemon juice and warm water creates a creamy sauce reminiscent of hollandaise. It’s not only healthy but also vegan—until you serve over poached eggs, that is.